Slots Social Casinois a classic style slots game published by Playport for Android devices running Android 2.3.3 and above. 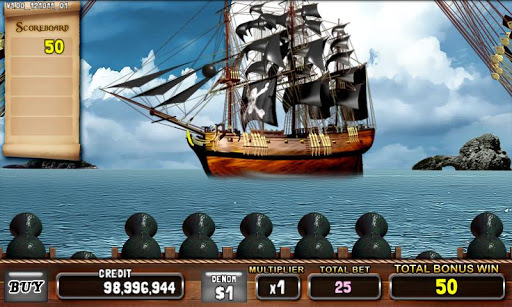 The game is free to play, with a variety of options for purchasing extra chips, although the player receives 1000 just for downloading with starting bets starting at 25. 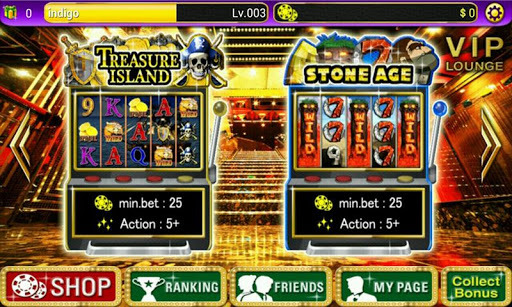 Your first 1000 chips is enough to get a feel for the game and to see if you want to put in more There is a large variety of themes for the slots, beginning with “Treasure Island” and including others like “Stone Age, and “Halloween”. The first time each one is played There are 9 available slots “machines” with 13 more coming soon. The catch is, you can’t choose which one to play, starting out. This means, you start out playing “Treasure Island” and once you reach level 3, by gaining experience from spinning the slots, you can move on to Stone Age, and so on and so forth. There is the opportunity to win free spins in the slots which allows you to extend how long you can play if you choose not to pay for extra chips. There is an auto spin function and a “Pay Table” button that shows all of the possible winning combinations. The graphics are are nothing spectacular, and neither is the sound, but despite this, the game is pretty addictive (but hey, isn’t all gambling?). And for those who are invested in Slots Social Casino, the prospect of the upcoming new themes is enough to keep you playing, to get up the the level required. Slots Social Casino is a classic fun slots game with all the basics of real slots and no real learning curve. Slots Social Casino is free from the Google Play Store and can be downloaded on any Android device with Android 2.3 or greater.